Do you have a video that promotes your talents and services? If you do, we highly recommend that you upload it to your GigMasters page. 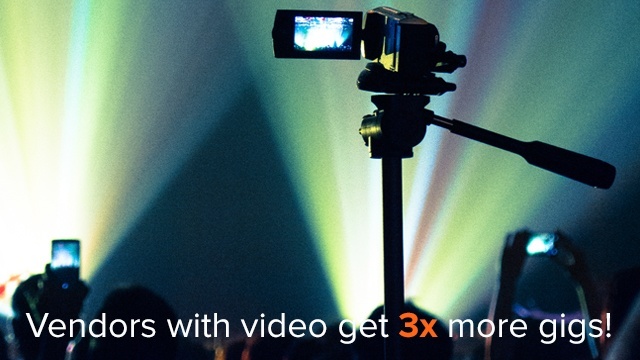 Our research has shown that vendors with videos get 3x more gigs! There are many ways to market yourself through the art of video. Whether it's raw footage of you performing live or a sizzle reel of your services, video content is an essential part of advertising these days. And in an age of iPhones and affordable GoPros, there's no excuse to not have a video. Now, there is a fine line between "being creative on a budget" and looking like an amateur. As much as it's important to have video up on your page, bad footage could backfire on you (turn away potential clients). If you know any photographers or videographers, I'd treat them to dinner TONIGHT and plan a video shoot. - Video killed the radio star! If you have any questions or you need assistance converting YouTube videos to your profile, contact info@gigmasters.com any time!